Light foxing to the page edges. Previous owners name inside front page. Good condition is defined as: a copy that has been read but remains in clean condition. All of the pages are intact and the cover is intact and the spine may show signs of wear. The book may have minor markings which are not specifically mentioned. Most items will be dispatched the same or the next working day. Very Good. 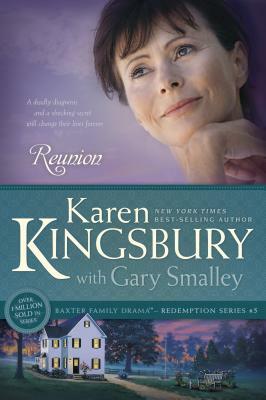 Reunion Revised Edition (Redemption (Karen Kingsbury)) by Karen Kingsbury, 2009-09-01. Trade paperback (US). Glued binding. 384 p. Redemption (Karen Kingsbury), 5. Very Good. Reunion (Redemption) by Smalley, Gary, 2004-06-01. Trade paperback (US). Glued binding. 400 p. Redemption (Karen Kingsbury), 5. Good. Reunion Revised Edition (Redemption (Karen Kingsbury)) by Karen Kingsbury, 2009-09-01. Trade paperback (US). Glued binding. 384 p. Redemption (Karen Kingsbury), 5. New. 2009. Reprinted. Paperback. Series: Redemption (Karen Kingsbury). Num Pages: 384 pages. BIC Classification: FA; HRCV. Category: (G) General (US: Trade). Dimension: 210 x 140 x 24. Weight in Grams: 322......We ship daily from our Bookshop. New. Trade paperback (US). Glued binding. 384 p. Redemption (Karen Kingsbury), 5.
baxters book series 2 book one. This book, though sad at times was an awesome book. I wish the Baxter Family Series would never end. Highly recommended!!! this authors books. What a wonderful way to end this series and now I have completed this series and also the First Born series and and waiting for the final 4 of the Sunrise series. I only wish the story of the BAXTER FAMILY would go on and on. My 13 year old grandaughter has started reading these books and it is my hope she will enjoy them so much she will complete all 3 series. This is the perfect ending to a 5 book series. Reading Karen's books seem so real and life like, it makes you want to be part of the fantasy, to only wish it was a reality!